IRVINE, Calif.--(BUSINESS WIRE)--The Storage Products Business Unit of Toshiba America Electronic Components, Inc., a committed technology leader, announces the addition of 12.0 Gbit/s1 SAS interface 512 native and Advanced Format models to its 15,000 RPM Enterprise Performance Class HDD model line. These newest additions are specifically designed for mission-critical workloads, delivering the benefits of 12.0 Gbit/s SAS host transfer rate and enhanced power management features for integration with rack-optimized data centers. Customer applications such as OLTP and databases will see improved performance from faster host transfer rates using 12.0 Gbit/s SAS controllers. Also, new AL13SX series models supporting 4K native sector technology may further improve application performance in supported environments. The AL13SX series is available in capacities up to 600GB2 in a power-saving, low-latency 2.5-inch form-factor. The 600GB is a 100 percent3 capacity increase over prior generation 2.5-inch models and provides faster seek performance and a lower power profile compared to legacy 3.5-inch 600GB models. Models supporting 512 native sector length technology provide optimum compatibility with industry-standard applications and operating environments. The 512n models offer industry migration to higher performing, more power and space efficient 2.5-inch form factor (when used with appropriate form-factor conversion hardware). Additional models supporting 4Kn or 512e Advanced Format sector lengths provide effective performance and data integrity for environments that support these sector technologies. In addition, Advanced Format models offer Toshiba persistent write cache technology for improved data integrity in un-aligned write scenarios. Model options with self-encryption features are also offered. With a speed of 15,000 RPM, the 12.0 Gbit/s SAS host interface delivers up to twice the host transfer bandwidth as older 6.0 Gbit/s SAS models. 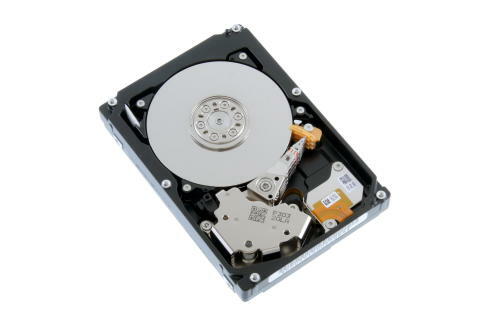 The AL13SX Series offers the same 600GB capacity as legacy 3.5-inch 15,000 RPM enterprise HDDs but with lower latency and higher power efficiency. The smaller 2.5-inch form-factor supports higher storage density, saving rack space and reducing the mission critical storage footprint and operational burden. Samples of the AL13SX 12.0 Gbit/s SAS interface enterprise HDD and Advanced Format enterprise HDD will be available later this month. For more information on Toshiba’s line of industry-leading SSDs, HDDs and SSHDs, visit www.toshibastorage.com. To connect with Toshiba Storage, visit the corporate blog at http://storage.toshiba.com/corporateblog/ and follow @ToshibaStorage on Twitter. Toshiba Corporation and its affiliates offer one-of-a-kind global storage solutions, offering hard disk drives (HDDs), solid state drives (SSDs) and NAND flash memories — technologies that drive a wide range of consumer electronics, computer and automotive applications, as well as enterprise solutions for the global marketplace. Toshiba is a leader in the development, design and manufacture of mobile, consumer and enterprise hard disk drives and solid state drives. In North America, the Storage Products Business Unit of Toshiba America Electronic Components, Inc., markets high-quality storage peripherals to original equipment manufacturers, original design manufacturers, value-added resellers, value-added dealers, systems integrators and distributors worldwide. Inherent in the Toshiba storage family are the high-quality engineering and manufacturing capabilities that have established Toshiba products as innovation leaders worldwide. For more information, visit www.toshibastorage.com. Toshiba America Electronic Components, Inc. is an independent operating company owned by Toshiba America, Inc., a subsidiary of Toshiba Corporation, Japan’s largest semiconductor manufacturer and the world’s sixth largest semiconductor manufacturer (Gartner, 2014 Worldwide Semiconductor Revenue Estimates, December 2014). Founded in Tokyo in 1875, Toshiba is at the heart of a global network of over 590 consolidated companies employing over 200,000 people worldwide. Visit Toshiba's web site at www.toshiba.co.jp/index.htm. © 2015 Toshiba America Electronic Components, Inc. All rights reserved. 1 Read and write speed may vary depending on the host device, read and write conditions, and file size. 2 Definition of capacity: Toshiba defines a megabyte (MB) as 1,000,000 bytes, a gigabyte (GB) as 1,000,000,000 bytes and a terabyte (TB) as 1,000,000,000,000 bytes. A computer operating system, however, reports storage capacity using powers of 2 for the definition of 1GB = 230 = 1,073,741,824 bytes and therefore shows less storage capacity. Available storage capacity (including examples of various media files) will vary based on file size, formatting, settings, software and operating system, such as Microsoft Operating System and/or pre-installed software applications, or media content. Actual formatted capacity may vary.